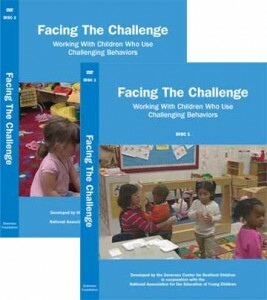 Facing the Challenge 2 Disc Set: This instructional, interactive 2 DVD set includes more than two hours of training and documentary video, providing teachers with strategies for working with preschool children who display challenging behaviors. In addition to the rich video footage, each DVD comes with a comprehensive trainer’s guide, filled with activities and guidance around using the videos for providing professional development to staff. If you need a formal quote, please contact Caroll Berridge at [email protected] or (866) 872-4687. NOW AVAILABLE! The Classroom Moments video clips can be purchased and downloaded directly from the web! Click here for more information. Designed to enhance training, this DVD includes 28 video clips from early childhood classrooms, including clips that illustrate Prevention in Action, Positive Guidance, Learning Opportunities, Developing Observation Skills, and Case Studies. In addition to the video clips, this DVD also comes with a trainer guide embedded on the DVD for use in developing training and workshops for staff. Once each DVD is purchased, a Trainer’s Guide can be accessed from each DVD. Should you prefer to download a copy of the Trainer’s Guide, click on the links below for access.